Following the hit-and-run killing of 17-year-old Ovidio Jaramillo at the intersection of Northern Boulevard and Junction Boulevard last week, local elected officials and DOT Queens Commissioner Nicole Garcia toured Jackson Heights and East Elmhurst streets yesterday with an eye toward safety improvements. Northern and Junction are wide two-way streets, with Northern being especially large. 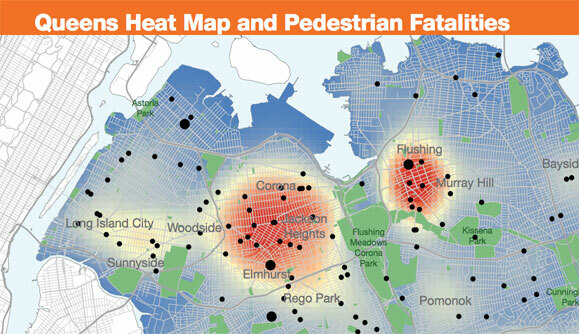 Both are priority corridors in DOT’s Vision Zero pedestrian safety plan for Queens, owing to high rates of injuries and fatalities. Yesterday’s tour was organized by Council Member Julissa Ferreras-Copeland, and State Senator José Peralta also participated. Garcia said her team would do everything in its power to make the neighborhoods’ many dangerous intersections safer for pedestrians. “All options are on the table,” she told Ferreras-Copeland. At the intersection where Jaramillo was killed, Garcia committed to installing a speed camera and said other possible treatments would be investigated. Other intersections on Northern recently received pedestrian islands and left turn bans. Left turn bans at this location would be problematic, Garcia said, since both streets are designated freight routes and turn restrictions could send trucks onto residential streets. From the beginning of 2012 through October of this year, there were 43 injuries and one fatality at the Northern-Junction intersection. Without a significant reallocation of street space to narrow the roadbed and shorten crossings for pedestrians, it’s hard to see how safety will improve much. Ferreras-Copeland brought Garcia and her team to two more locations: the roundabout at Ditmars Boulevard and 102nd Street, the site of a number of crashes, and the intersection of Ditmars and 27th Avenue, where there have been 11 traffic injuries in the past three years and residents have complained that speeding trucks cause their homes to shake. 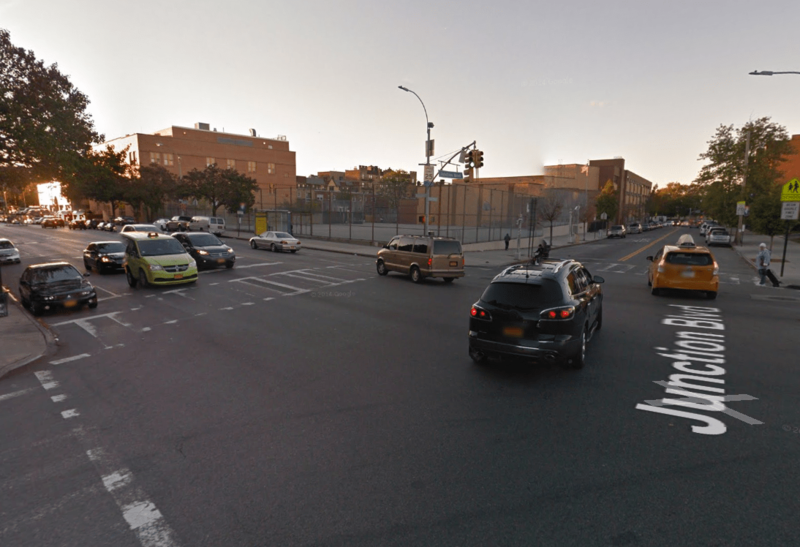 Last month, Peralta held a press conference with Make Queens Safer reiterating his 2013 request for a traffic study and “complete redesign” of the intersection of Roosevelt Avenue and 90th Street. His office says DOT responded to the initial request but has yet to follow up with an actual study. Ferreras-Copeland is optimistic changes will come. “DOT and the borough commissioner understood the urgency there is to make streets safer in Corona and East Elmhurst,” she said after the tour. “They have been very responsive to my requests, and I look forward to improvements on the corner where Ovidio lost his life and throughout the district.” Her office plans to follow up next week with a letter to DOT requesting a study of Junction and Northern Boulevards. Halt traffic in all directions for perhaps 30 seconds to give pedestrians time to cross!